Our new 27' tropical themed water slides feature easy to climb steps and a super fast sliding surface. This dual lane water slide features a dual lane slip & slide attached so the sliders get a long ride down. 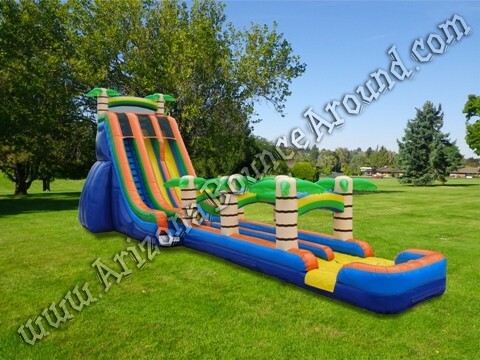 We are the leader in big water slide rentals in Colorado with the best selection of giant water slides for parties and events anywhere in Colorado, California, Nevada or New Mexico so start planning today. Our 27 foot tall dual lane water slide is perfect for kids and adults featuring easy to climb steps, dual sliding lanes and a super slick sliding surface. The slide and slip n slide both feature water spray systems built in so it stays cool and fast. Add a foam machine to this water slide for even more excitement. Just say "Make it Foamy"
Over the years lots of inflatable rental companies started renting 27' tall water slides but the only way to have a slide this tall used as a water slide is to have a 30 to 40 foot long slip and slide attached the way our water slides are rented. You get allot of speed sliding down a big water slide and the riders need room to slow down so don't be fooled by companies offering dual lane water slides without the slip n slide attached. All of our big water slides over 19 feet tall feature long run outs and no pools at the end to keep the slide clean and sanitary during use. When you rent water slides from Gravity Play Events you get years of experience and all the details covered so don't be fooled by cheap prices or miss advertised water slides. We rent water slides for every age group and budget from birthday parties to special events so trust the leader in water slide rentals in Colorado when you choose your next water slide. We offer taller dual lane water slides including our 42' tall dual lane water slide and the amazing 51 foot tall dual lane water slide so be sure to check them out. 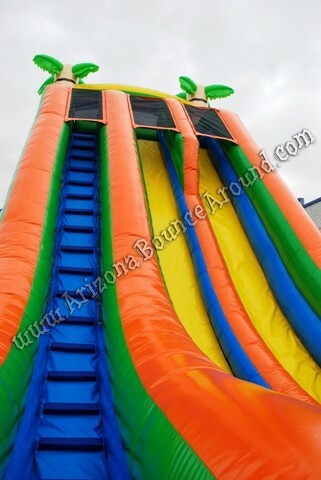 Our 27' tall dual lane water slide is super fast and features a dual lane slip & slide connected for good clean fun. attached at the top of the slide and above the slip & slide. Our 27 foot tall dual lane water slide rental features easy to climb steps and a steep slide surface sure to please all age groups.